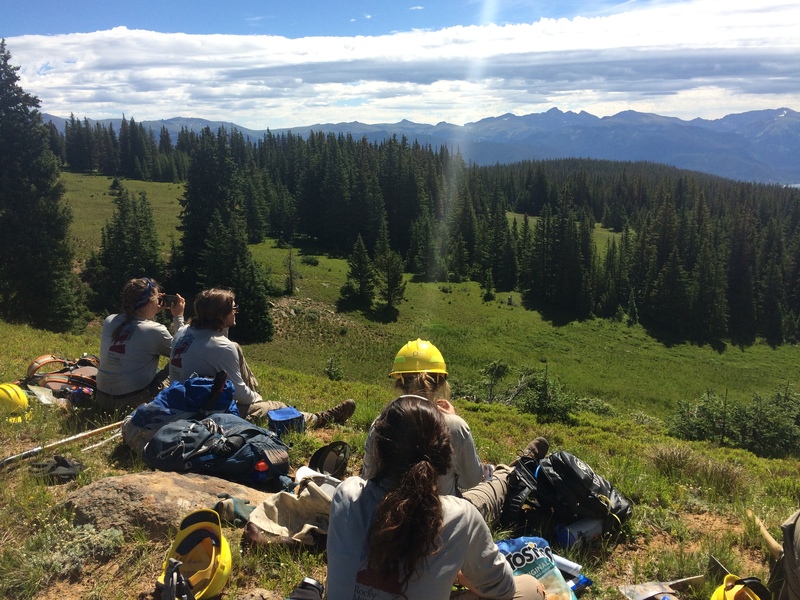 This week the Rawah Crew went out on another 4-day hitch, working part of the Link, Medicine Bow and McIntyre Creek trails. We had over 15 miles of trail to cover so our main priorities were clearing the downed trees from the trail corridor, major drains and defining the trail corridor. 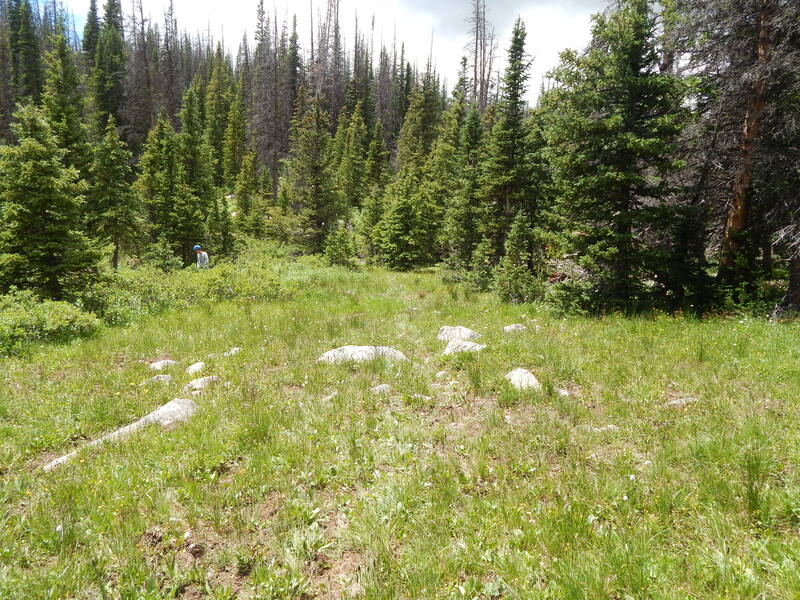 The Medicine Bow Trail is pretty lightly used; therefore some sections of the trail were grown over completely. We retreaded a 150+ ft. section of trail that was covered up and made finding a stream crossing quite difficult. We also spent time marking the trail by constructing cairns (stacks of rocks) through marshy and densely forested sections to help guide hikers through some rough sections of the trail. These areas of the Rawah Wilderness have some sections with quite a lot of beetle kill and therefore there was a lot of work to be done clearing trees. Along the way we cleared close to 50 downed or hazard trees, 20 on the Link Trail and upwards of 30 on the Medicine Bow Trail. On our last day, we made our way up into the alpine on the Medicine Bow Trail and were rewarded with some magnificent views of the Rawahs, Medicine Bows, and other ranges in southern Wyoming. With the Medicine Bow Trail recieving little traffic, the trail was not apparent. The crew followed cairns marking the trail up over the ridge of the Medicine Bow Mountains battling 50 mph winds (with otherwise beautiful and sunny weather), to meet up with the McIntyre Creek trail. We removed a few trees from the trail and cleared drains on the 4.8 mile stretch and finally met up with the Lower McIntyre Trail (cleared early on in the season). After hiking the final stretch back to the trailhead, we had put in an tiring 12 mile day. 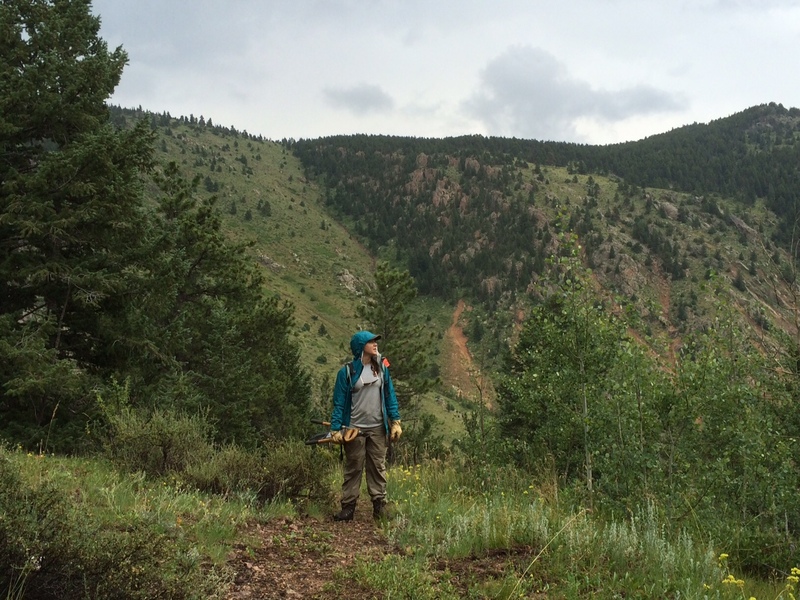 With the Rawah Wilderness and trail system being so remote, we usually don’t have any prior knowledge of trail conditions when going into a project. Therefore, priorities may change quite a bit from the original intentions. 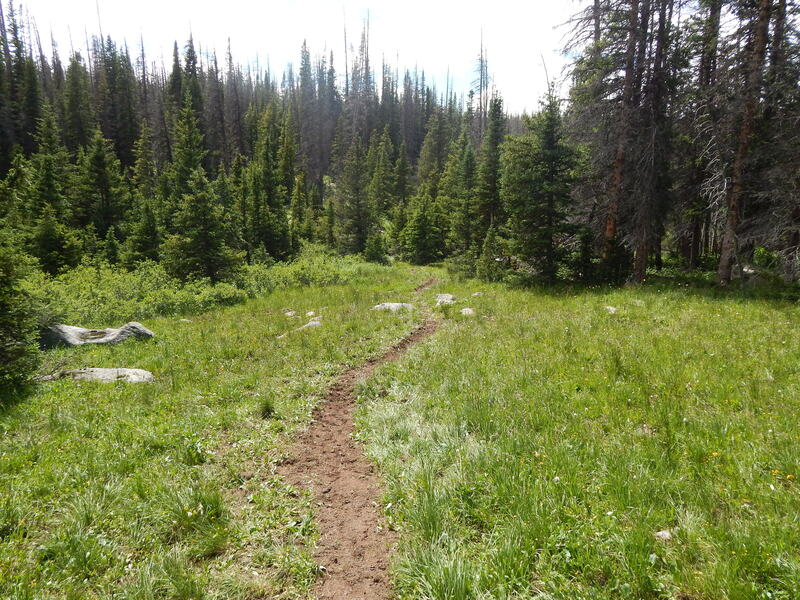 Once we began in on Link and Medicine Bow trails, we realized that there was a lot of work that was needed with trail corridor clearing (trees) and work defining the trail in some areas and had to shift our project focus. 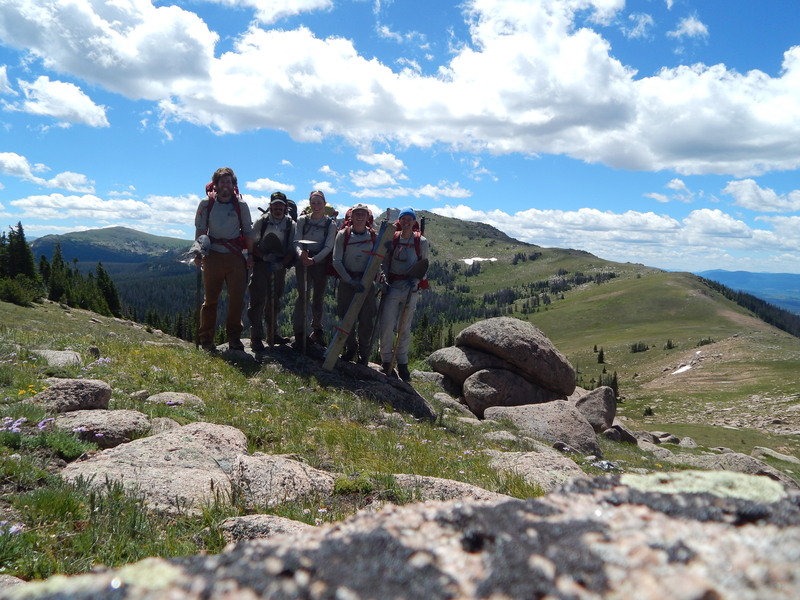 The Rawah Crew atop the Medicine Bow Trail. 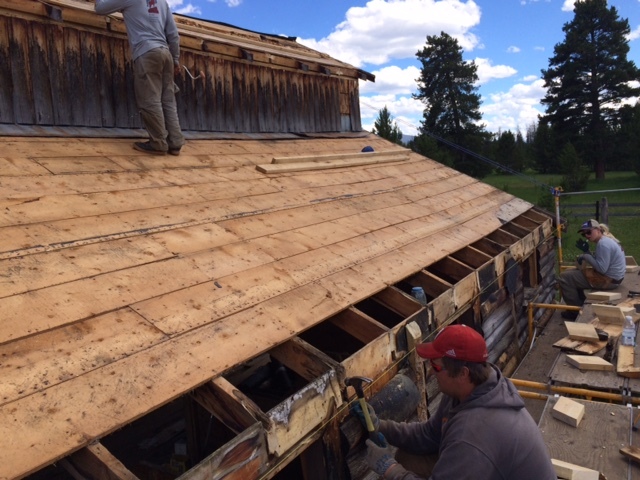 The Kawuneeche Crew completed one half of the Little Buckaroo Barn roof this week, using new tools and asphalt shingles, giving the barn a polished silver gleam. 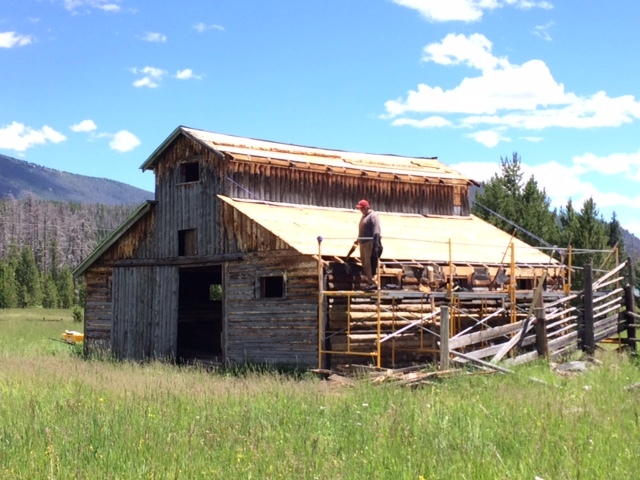 With one side completed, we disassembled and reassembled the scaffolding in the opposite side of the barn. 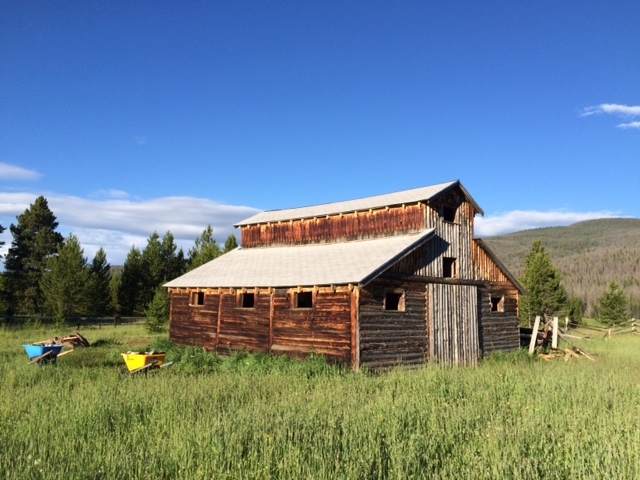 After half a day of demo, the second side of the barn is bald and ready for new tar paper and shingles! We also removed the rotted rafter tails and fitted new ones into their places, ready for epoxy assemblage next week. Now experienced roofers and good restorationists, our work is going a lot faster and more fun! Throughout the week the a few of the crew members reported to the east side of RMNP to help the Special Projects division reside one of the cottages in Moraine Park alongside NPS professionals from all over the country participating in the PAST Program, a training program to certify NPS staff as historic preservationists. Lastly, Geoff joined us for a day of work and got to help the first half being finished, and joined us for crew dinner of Logan’s venison burgers. Yum! This was another exciting week for the Boulder Crew. We spent Tuesday working on the Bright trail, a flood damaged trail alongside the North St. Vrain creek. We installed drains and and cut back the trail corridor. On Wednesday we drove and hiked to the Bright Trail extension, where we logged out downed trees and installed drains. On Thursday we returned to the Bright Trail and finished installing drains that we didn’t reach on Tuesday. Finally, on Friday, we returned to the Buchanan Pass Trail where we spent the first three weeks of our season. After inspecting the bridge and turnpike that we built, we hiked further along the trail and cleaned drains. We then returned to the work center and began to prepare for our 8 day bridge building backcountry project, which begins on Tuesday. It’s been a great week and we are super excited to spend some time living and working in the wilderness over the next two weeks! This week, the Shadow Mountain Crew had a break from being backcountry and spent the week doing maintenance runs around the Monarch Lake region. On the first day of the work week, the whole crew and three members of the Forest Service set off on an unmarked trail to Strawberry Lake. The goal was to dig drainage dips to maintain the trail and help prevent erosion. The crew stopped for a short snack break at the beautiful Strawberry Lake. This lake is surrounded by fragile marsh and is highly impacted by hiking traffic. The group then split, with half of its members continuing down Strawberry Bench trail, and the other half heading down Doe Creek Trail. 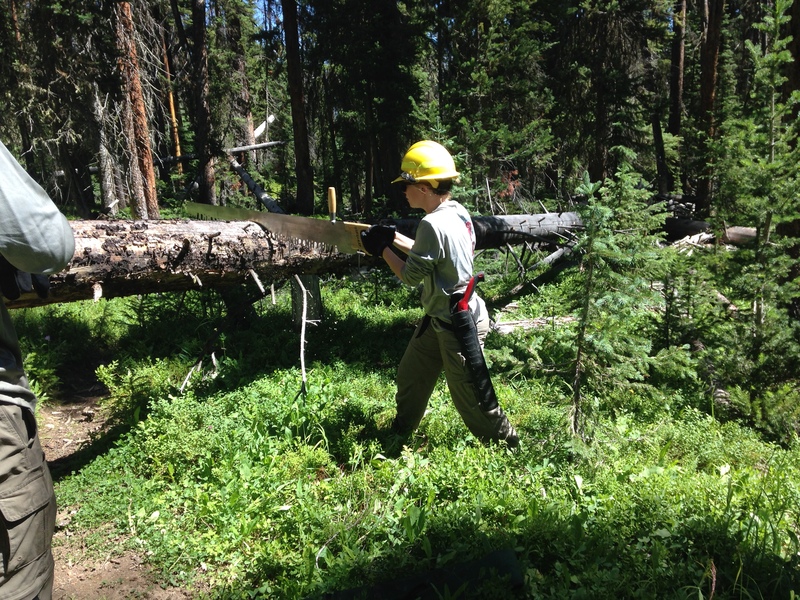 These trails are not designated wilderness, so the crew got an opportunity to observe their Forest Service coworkers using chainsaws, rather than crosscut saws, to clear tress. This sure made the trail clearing process much quicker and noisier! Towards the end of Doe Creek Trail, the Shadow Crew encountered some peculiar live animal traps set to capture a missing poodle named Jax. The next day the Shadow Mountain Crew split in half once again to cover more ground on the High Lonesome Trail. 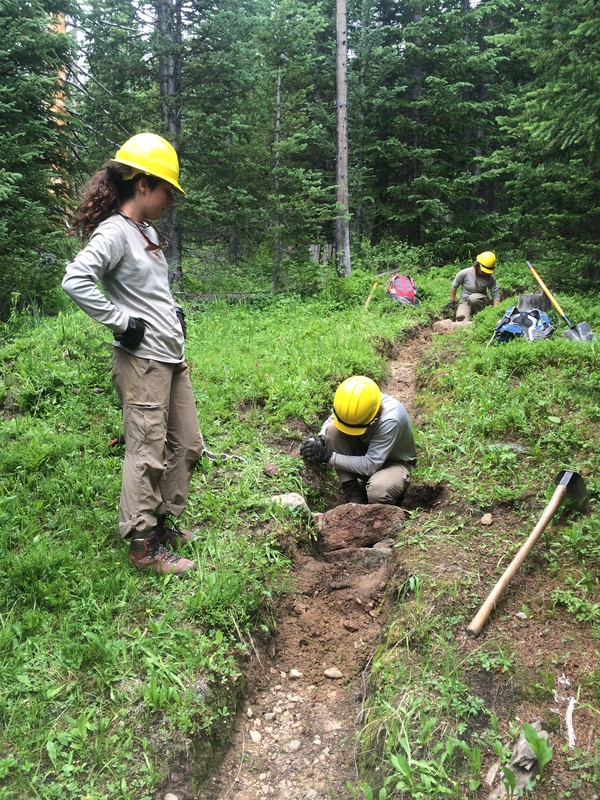 Combining efforts, the two groups were able to dig dips and clear trees off over 20 miles of trail. Geoff accompanied the Shadow Crew to work the next day to restore the highly eroded Wolverine Bypass Trail. Geoff taught the crew how to construct check dams on especially steep sections of trail using large rocks. The crew spent a good portion of the day transporting heavy rocks to the trail in order to slow the flow of water down the trail. After such a busy work week, the Shadow Mountain Crew was excited to stop at the local Kum and Go to celebrate the unofficial tradition known as “f’real friday”. The crew got their milkshakes and filled up on gas, then headed back to the Shadow Mountain Village for a relaxing weekend.